On the same shopping trip where I bought knee socks and pajama pants she made the more ambitious purchases of mint green nail polish and poppy red lipstick, which indicated that she was the more likely of the two us to get off the couch at some point and do something with people who do things. This scarf that she made is just the continuous pattern of whats referred to in my go-to-crochet-book as the strawberry stitch. And if I weren't obsessed with cropped photos of late, and had I asked her to spread the layer out, you would see the repetitive strawberry motif. But I didn't, so you cant. But anyway, she only began this scarf for herself after she had made precisely one Amigurumi animal for each sibling as a Christmas gift. The kids have been begging me for (uhhhhh) two years to make these, and it took Juliana being here for someone to do it. As she worked on them in plain site the kids would bombard her with whines, wimpers and whys about how they wanted one too, because Juliana insisted that she was making them for her friends. Sorry I don't have a pic of them at present, but they are loved and scattered around the house. Smack. Right on that cheek. Juliana is the family crochet fairy. The kids were so excited by the little owl, duck, penguin, coffee mug, turtle and octopus. Sigh. * Dear sweet Judi has posted a little Q&A we did over at her SewRetroBookBlog today, and (thats a big AND) I'm giving away quite the pile of sewing loot and she is giving away a copy of her lovely book over there too! So head over and say hello....I think she has a question for you to answer in the comments, so be good and follow instructions, or you will be sent to the back of the line. * I am so excited to have been asked to be a judge for the Handmade Olympics created and hosted by rikrakstudio. I will be judging the blog category, so go make your nominations now! There are over $2000 smackers worth of prizes, so better yet, have your friend go nominate you! * I'm sure you and your kindness have already been directed towards flood relief efforts for Queensland, but please also visit Toni Coward's MakeItPerfect blog to support all the blog auctions that she has listed there. There is gorgeous stuff up for grabs and all for a good cause, of course. If you can't purchase anything just directing some of your own readers or pals there will be so appreciated. I plan to post something for auction here tomorrow, so please check back! *Okay kids, I think that's it. *Oh wait. This isn't nearly as important as those items listed above but yesterday at the Verizon's after being told I was due for a completely free Droid, and went through all the hutzpuh to get it, I actually heard this statement come out of Verizon girl's mouth: "Okay, so your total for the free Droid comes to $130.17". I repeated it back to her hoping she would find the humor in it by placing an emphasis on the word "free". She didn't laugh, but said something about a rebate that I can't remember. Which I think is part of the plan. This is a lovely heart-warming post. Gosh she is beautiful! Love that lip color! Thanks for the animal site, I've been thinking about those. I just love your posts, your family sounds like so much fun. Ok, someone be honest, I've never crocheted...is it hard to learn? I think my kids need some of those animals. 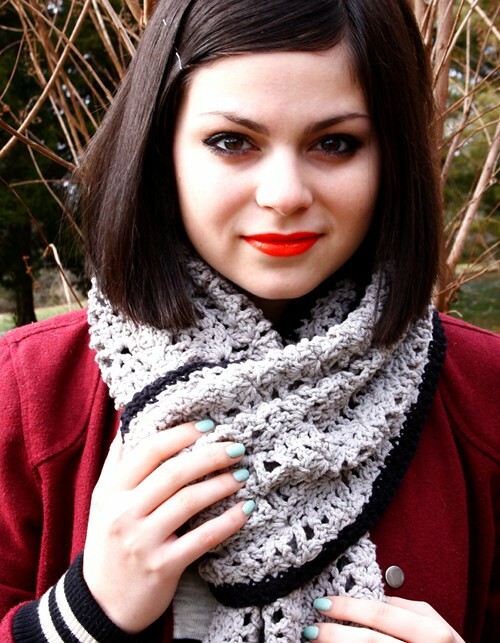 she is a beautiful girl and I understanding completely the feeling crocheting gives you, I'm a knitter. And, the fact that you can do it together is precious. Ahhhhhh. So heart warming. Mothers, daughters, brothers and sisters. Yarn, makeup and family time. Very special. Oh, Anna-Maria, your children are beautiful and it's always a pleasure to see your blog. Juliana is a champion of the crochet ! Love the scarf - gorgeous (and your daughter too, of course!)! 1. I wish I could crochet! 2. I wish I could pull that lipstick off! What a stunning young woman! She is such a thoughtful sister to make treasured gifts for her siblings. Ok, now I must try crocheting...you have inspired me once again, Anna! Anna Maria, crocheting the stitches IS easy - true - but following the instructions not necessarily so! I recently tried (and tried and tried) to make leg warmers; ripped them out so many times the yarn finally weakened and broke! I'm knitting them now. I just didn't get it, even after looking in books and online for help. There doesn't seem to be much online help for crocheters as there is for knitters. Hey!............maybe YOU could do some of those little video instruction series for different stitches and techniques! Think about it?? I need to go buy red lipstick and mint green nail polish now! Well, there may be only one THING I love as much as fabric, and that is my DROID. I hope you love yours as much as I love mine. It is amazing having the world at your fingertips 24/7. It takes a little while to learn, but you shouldn't have trouble because of all the tech-savvy kids around. On the fabric subject, my husband invited me to go along with him to a conference in Florida - first time in 30 years of marriage! So I used my Sizzix Big Shot Express to cut a whole bunch of hexagons from my Little Folks voile to work on while he is working. I almost cried having to cut it up, it is sooo silky and swooshy. I don't know what I'm going to make yet, but I am seeing a lot of hexies lately, so I'm going to play with them. The scarf is beautiful, but your daughter, oh my. What a stunning girl she is. There is something kind and warm beaming from her eyes. I love how you write about your relationship with your children. My little ones are still very young and I hope our relationship will be as loving, strong and warm as yours when they are older. You amaze me Anna Maria. Seriously Amazing. And that beautiful young replica of you is following closely on your heals. So sweet. And such a good big sister too. I have always been curious.... How many siblings do YOU have? I just one brother and one sister :) thanks for the kind words, she is a thing of wonder, that I feel I had little to do with- but yest those middle teen years- WOW what a struggle. 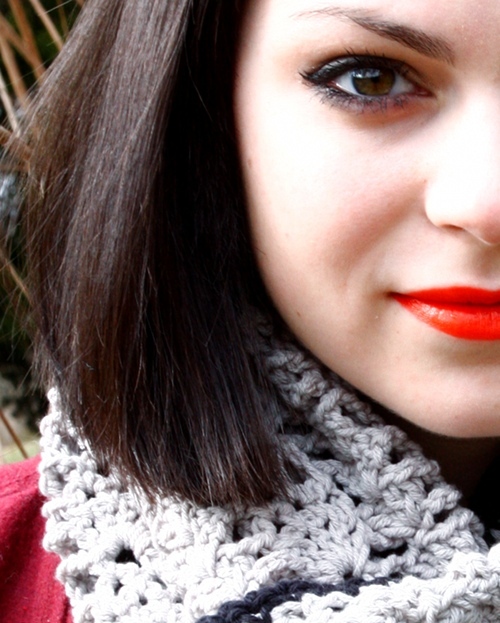 gorgeous crocheting, gorgeous poppy lipstick, gorgeous mother & daughter, gorgeous blog. cheers! What gorgeous photographs of Juliana!!! What a sweet big sister to make all those crochet friends - hope to see some of them here. Another beautiful scarf... And I love Juliana's lipstick. She is beautiful in every way. Beautiful scarf, too. I am reading The Friday Night Knitting Club by Kate Jacobs. Heard of it? I think you (and daughter) would enjoy. This post so warmed my heart Anna Maria. I always had good relationships with my 2 girls (one did push the limits as a teenager but we came through to the other side all in tact) but to sit with them now, or have them call to chat, laugh or even advice..it takes my breath away! We are both oh so blessed. And oh my is she gorgeous and kind too! Love Julianna's lipstick color! Looks so pretty on her, also her hair looks darling. My daughter and I want to take a class this summer to learn how to crochet. We bought some books, but I think we need one on one help. Hi! I am about seven years ahead of you on the same mother/daughter journey. My daughter is 25, finished university, continuing education, and working at same school. All great things, except 2600 miles away. That part was never part of the plan. Life changes, plans change. I do enjoy reading your thoughts and experiences with your family. However, when you write of the eldest, my heart twinges just a bit for the days gone by. We used to sit and knit/crochet in the exact same way over school holidays. We still do. I'm glad you treasure life while it's happening too. makes for very entertaining reading - No cringing here ! I promise. I love to read your blog, it is so colourful and also so sensitive when you write about things that matter so much. The love you bear to your children for instance. I remember I had to put a tear away when you wrote about Julianna when she went to college and how she was born. My eldest son is 19 also (bit I'm much older then you) and although he still lives at home I fear the day he's leaving. Although here in Holland the distances are very different comparing to America, he will be moving to study in Amsterdam, (120 km. away) it is the end of an episode. Well, now he's working and in a few weeks he will leave for Australia. I'm glad he's going to Australia, first he was talking about Africa!! !But Australia, So far far away. I think you're an awesome, and very kind and warm woman.And you've seemed to create a very nice, warm and beautiful (and colourful) home for your husband and children. I do envy you a little. love to you, and tonight I will write a comment at the blog you mention. Just imagine, 'winning'something from you. Anyway, I was confused about the Driod, (but I understood your joke) and now I understand it is a phone. My oldest is 5 and I just wish I could freeze her as she is right now. Your blog post gave me hope that even if I let her grow up (I guess it's going to happen whether I want it to or not), everything is going to be all right. They always get us with those silly rebates. Why do they bother??? Julianna looks beautiful- I love her haircut!!! Julianna is absolutely stunning and the fact that she's as talented as her beautiful momma just adds to the wealth. I always enjoy reading your blog because it's about every day family stuff. Your daughter is beautiful. I completely understand how you feel-don't all moms? You express it so well! It brought tears to my eyes....my girls are all grown up and live away, but I always feel so great after a visit. Anna Maria, I agree, your daughter is beautiful and her haircut was the first thing I noticed. But, oh, the crochet! 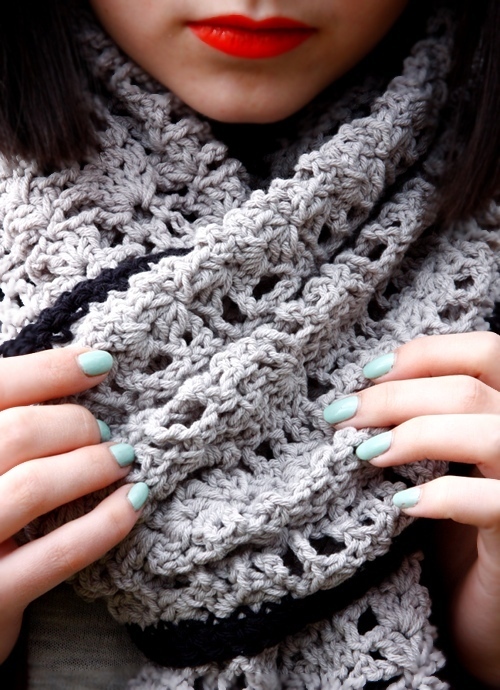 I have been crocheting since I was a child & have been on the lookout for some new patterns/techniques. I ordered the Crochet Inspiration book, I can't wait to try that strawberry stitch. So pretty! I am not a crocheter I am a knitter. I loved this post and I'm sure your daughter feels the same way. I live in Alaska and my family in Indiana. There are few things (aka my daughter and husband) that I treasure more than the times I get to sit with my mother and knit late into the evening. I have to know the brand and color of that lipstick! Good Lord, girl...you really inspire me. I just bought my very first crochet pattern and you make me believe I will survive next year: my oldest daughter's first year of college. Your description of crochet describes my feelings exactly! 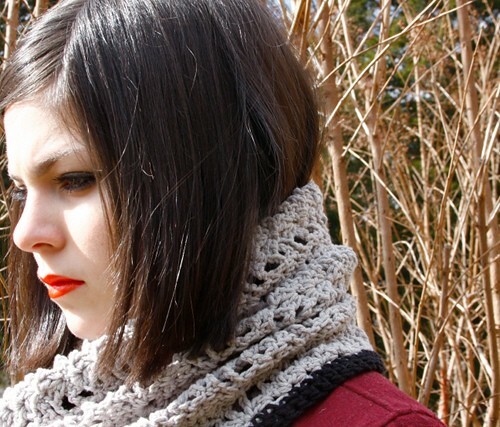 Lovely scarf, and I would love to see pictures of the amigurumi's that she made. I was on a big amigurumi kick for awhile, but haven't made any recently. You've inspired me to pick up the hook again! Oh my gosh she is a picture of you. How gorgeous she is. I love the scarf what a beautiful family you have. She is so gorgeous and I completely connect with you on the bonding over yarn. I have two teen girls and I hope they keep coming back to it like yours. I was too late to comment on your next post.. But I really wanted to say thank you for your kindness. I live in Brisbane, Qld and we evacuated because we live in a flash flood area. We were likely to flood just from the rain. The house is only 12 months old so no one could tell us would happen. By the time they announced the big flood for brisbane we realised our house would go 4ft - 7 feet under water. It was very hard to take what we could and say goodbye to the rest. The flood didn't come as high as it could have thanks to the dams. We were grateful. We drove back at 4:30am (peak) to see how high the water came ... and it was dry? We were in shock for 2 days. DRY!? There was no chance it would be dry.. but it was. So in a daze, but grateful we begun helping others, we were working the phones by 5:30am. Our whole city has pulled together. Our friends and loved ones are beginning the recovery process. I wanted to thank you for your kindness and Diane for her generous bid. The people of qld thank you. She's looking really gorgeous, I love them she has to wared every fabrics and use product's. what a beautiful quilt and it goes without saying...your son is such a precious little bundle. looking at the back of his sweet little head while he's sleeping reminds me of my daughter's days in her crib..truly a "moment" in time. i watched your video for the new book...it's awesome! I have enjoyed "seams to me" so much(blogged about it over at my blog).